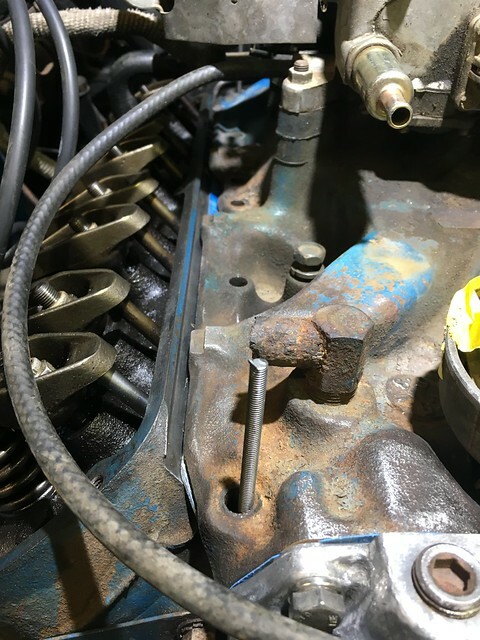 I’m not so sure about the leak down tool. It’s kind of tweaky setting the zero point. Much tweakier than I remember but it’s been a couple years since I’ve done the diagnostic. The couple of engines I did in the meantime (one of the is still mostly in parts delayed by getting the Mustang) came in and were stripped down and sent to the machine shop when they got here. Not tweaky enough to pay the big bucks for the truck tool or even a good brand from the online tool guys. I’m not going to be using it for absolute measurements but for comparisons to the other cylinders. I’m only testing a few holes, the two that showed the most issues in the compression test, #1 and #5 and random test of another to validate the first two. Test of #5. It’s the one with the best compression specs of the bunch but the most carboned plug. 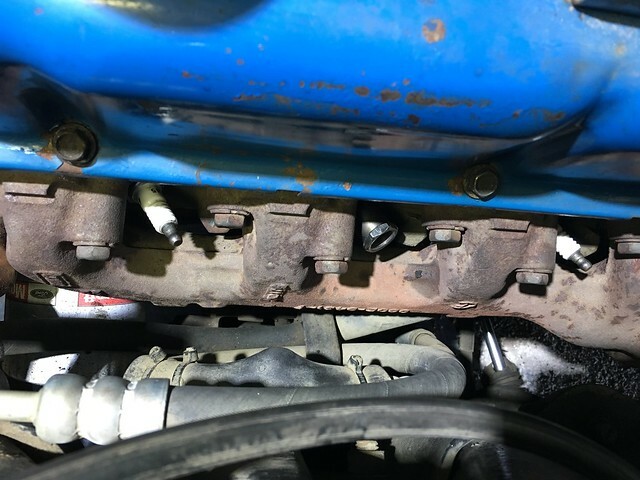 Just as I suspected, leak in the intake valve and rings. Sounded stronger in the dipstick hole than the carb. Exhaust and cooling good. It’s got to be more than the percentage shown but still enough to want to rebuild after the summer. Here’s #1. It’s a bit hammered. Big leaks from the rings and exhaust. 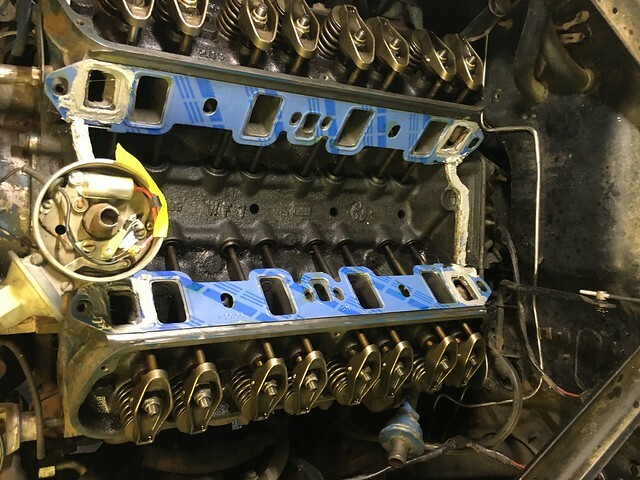 The head gaskets seem good all around. Will be interesting to see if that heat signature from the cooling diagnosis was part of damaging that cylinder. It was the weakest one by far. 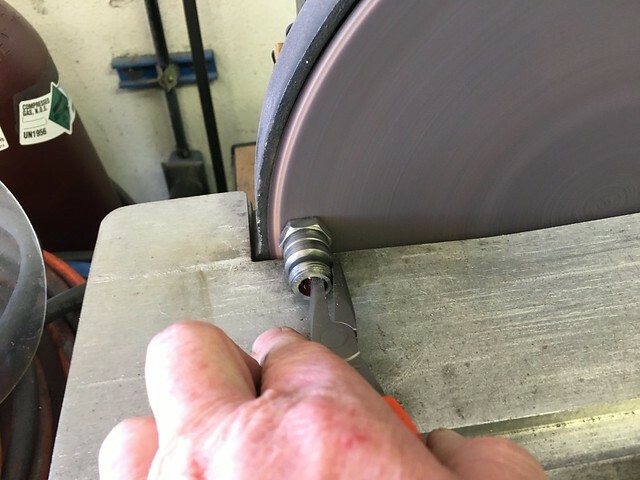 My guy measures all the cylinders (and I do before I send them in) before he calls with the news on what needs to be done. I’m sure this one looks nothing like the rust bucket of an Olds 350 I took in some years back and he was able to pep that one up. The random cylinder tested a bit better than #5. 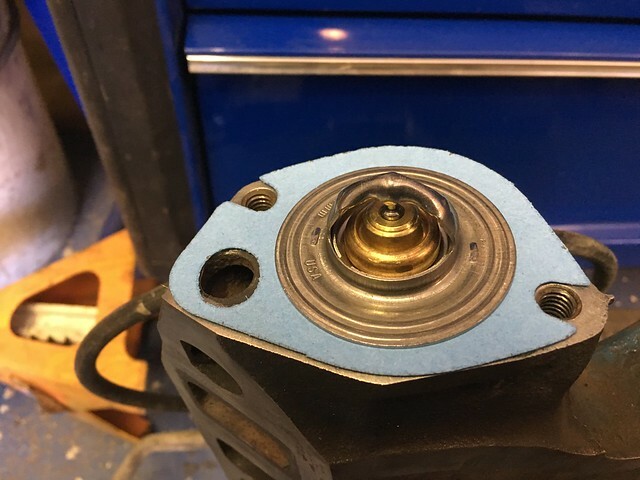 No valve leaks to speak of but a definite ring leak. With that I’ll back burner the rebuild as originally intended. I can’t paint now until Sept, too hot. The catalysts won’t cure properly. I’m going to refresh the engine bay, suspension, the whole shebang once it gets cool enough to paint again. Meanwhile I’ll get it back on the road then focus on the the steering system rebuild. 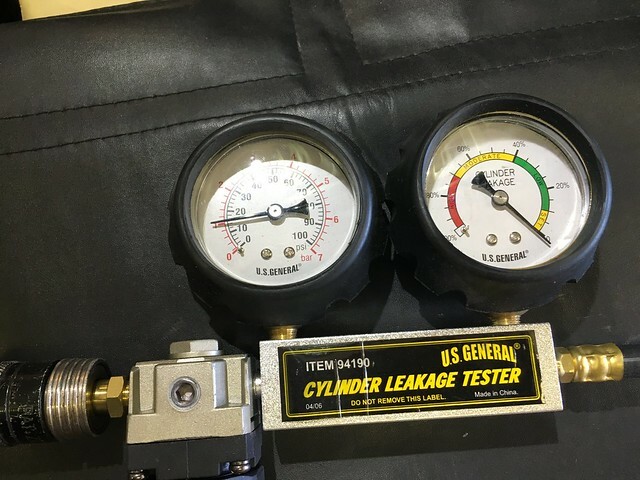 My HF leak down kit has no adapter for the olde tyme plugs. (that would be 18 mm for those keeping score) It’s not a bad kit, available and affordable. 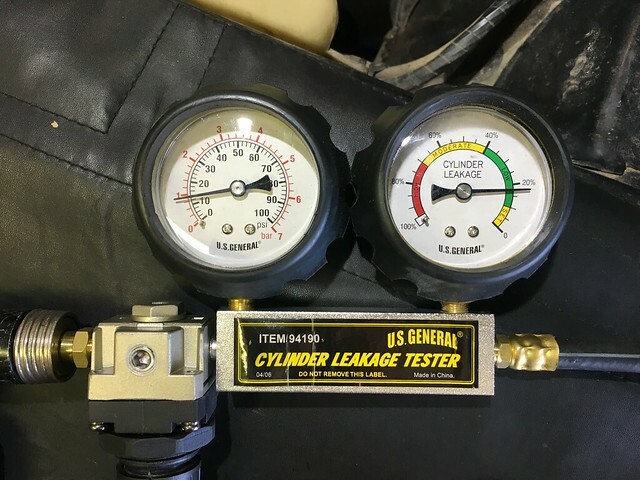 It can only take about 15 psi before the leak down gauge freaks out. 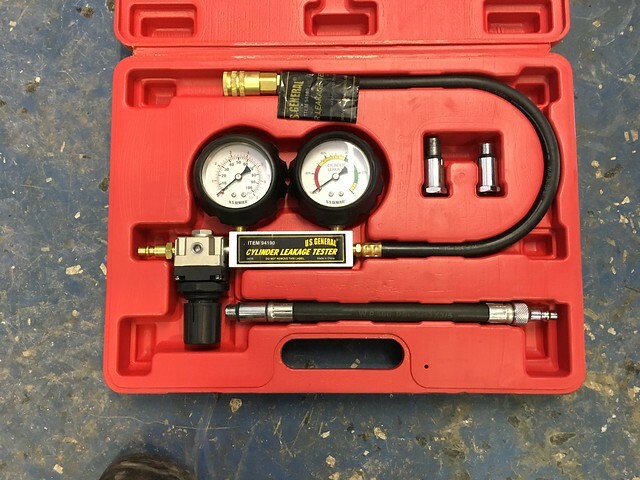 The good ones can do 100 psi. They are also quite a bit more money. I did the Miata and Ranger with this one and it worked fine. Because 14 mm plugs. I did at least one of the hobby stocks with one I borrowed from the truck at the time which was eons ago. No adapter so I start calling and looking. 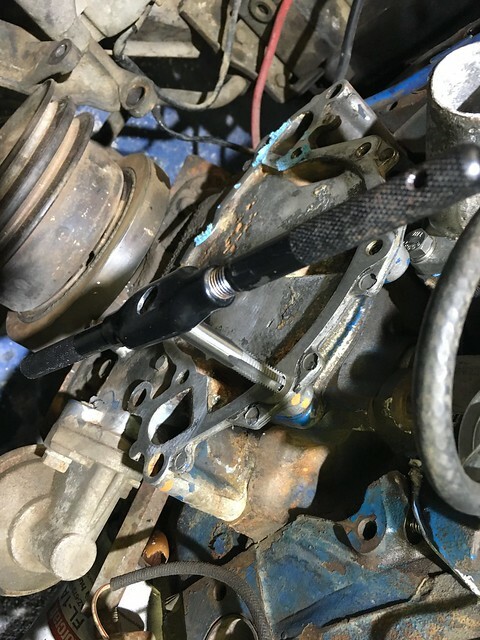 Nothing on the truck, he can order but knows the thread size on the HF hose isn’t the same as the SO hose so that will require hose and adapter. Maybe and air fitting as well. And he doesn’t have one on the truck to borrow. Amazon yes. Three piece, under $15 two day shipping. NAPA, no. Chain parts stores don’t have one to loan. I think I’ll make one out of a spark plug. I don’t want to butcher one of my new ones. I dig through one of the trash cans in the shop to find the old rusty plugs that were in the car. Gonna need to cut that neck off to get the porcelain out. Hopefully I’ll be able to cut some 14mm threads in the plug carcass. I’ll use Mr. 3″ cut off wheel. One of my go to tools for this kind of thing. If you don’t have a compressor or much of a need for a specific cut off tool I recommend an electric angle grinder. 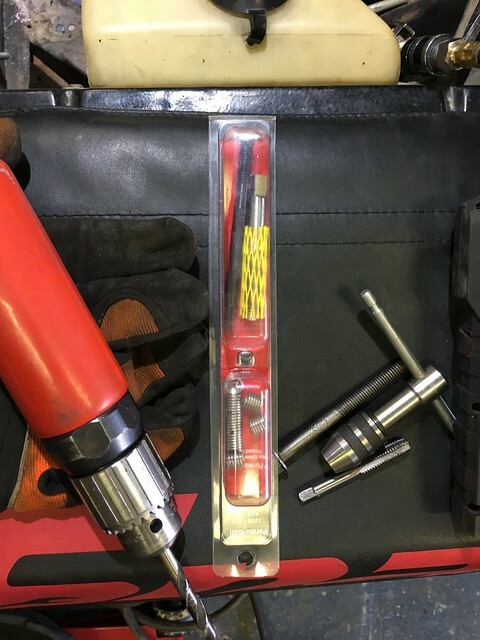 Having one is a must have for any toolbox. It’s versatile, can cut, grind, brush, sand. Those that fab all the time have at least four to six each with a different wheel so you don’t have to change or different sizes and the like. I’ve had this Dewalt for 8-10 years, rebuilt once. 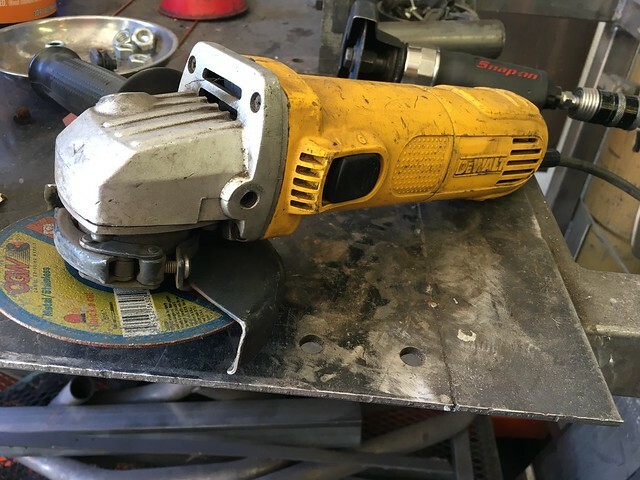 I’ve got about half dozen angle grinders of various sizes, mostly this kind of Dewalt. The HF grinders, even the older one’s work well. I had one for a few years using it regularly until it burned up. The new ones are supposed to be pretty good. Shoulder removed and ready to separate. Just pull it out. Grind the electrode contact off and we have a core. 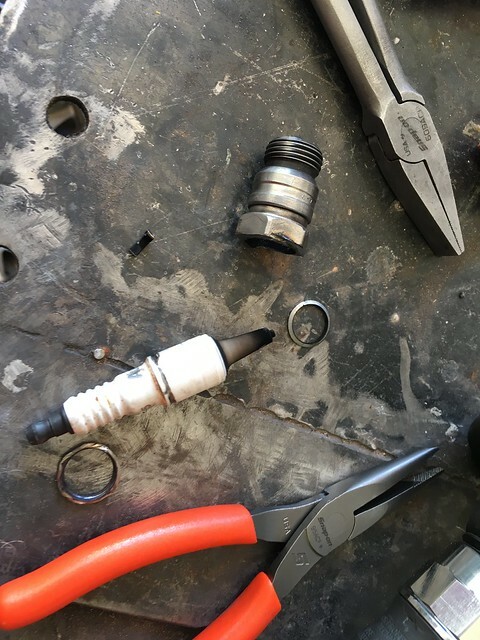 No joy for threading another adapter or even general air fitting. So what to do? Weld in the smaller adapter in the kit I’ve never used. 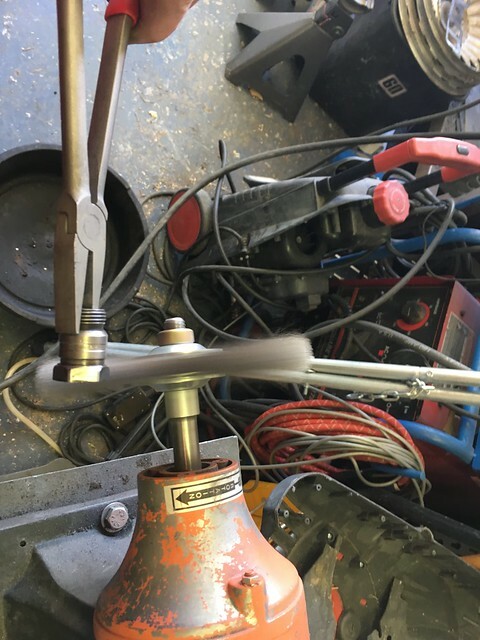 First I need to grind the chrome off the part. It’s hard to weld and the fumes are hazardous. 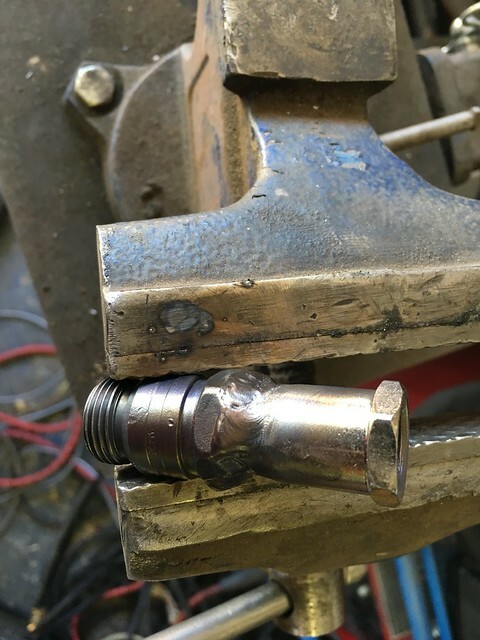 Then I need to clean up the plug fitting so they’ll cleanly weld. It’s cleaned up, washed with acetone and ready to be fixtured. 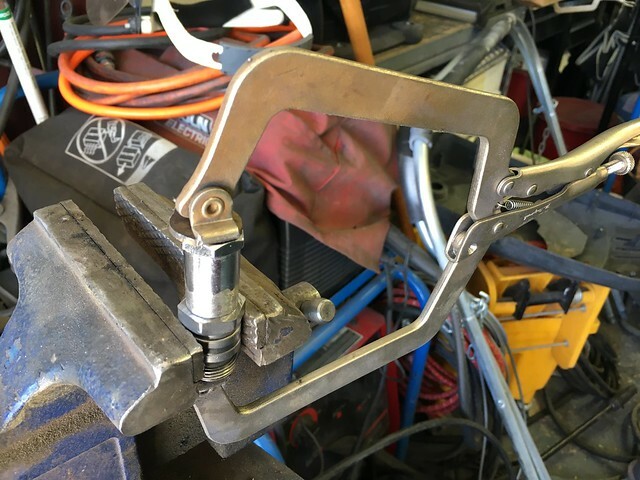 I’ll weld this one using the TIG process. Need to prep a tungsten, I use gold for this (1.5% lanthanated) and ER70S2 filler because that’s what I had in front of me, argon and DC- at 125 amps. Tack it all four sides before the finish pass. That’s a standard way to join tubing. Now for the finish pass. Not my best work. The small diameter and the thick wall tested my ability on this one. Not the cleanest but it will work. I now have an adapter but I’m out of time in the shop today. Had to skeedaddle to my day gig. I’ll get to the leak down tomorrow and hopefully finish before my cooling system parts get here. The thermostat housing mystery is solved. Turns out it’s not really a mystery. 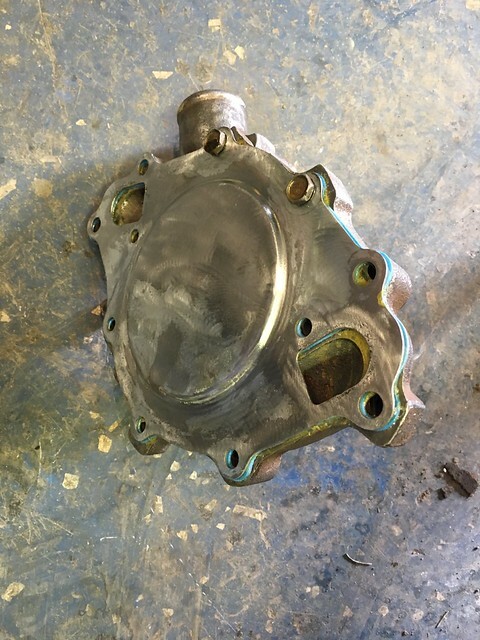 It’s a part from a 1987 Ford V8 used in F150, Bronco and Country Squire station wagons. I’m sure there are other old guys here that remember those. When I was in second grade we had a Chrysler Town and Country station wagon. Complete with fake wood grain. I finally decoded the part number by realizing the second character is a numeric and not an alpha. Looking at the Drake reproduction for the car the pic at CJ had the 64-65 part number. A gander at Mannel shows the right casting numbers per year with pics. I’m still learning how to use the appendix in Mannel to see which parts span multiple years. 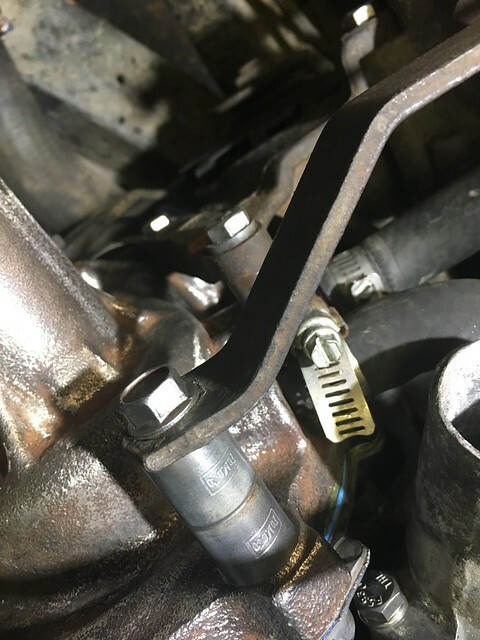 For example in the section on your engine there might not be any specific info on that part if it were used in a prior year. Many times, probably most times, there is a reference to using the same part as previous years. To find which years you go to the appendix for that type of part and there will be a chart with both casting numbers and engineering numbers and a reference to a pic of that part. 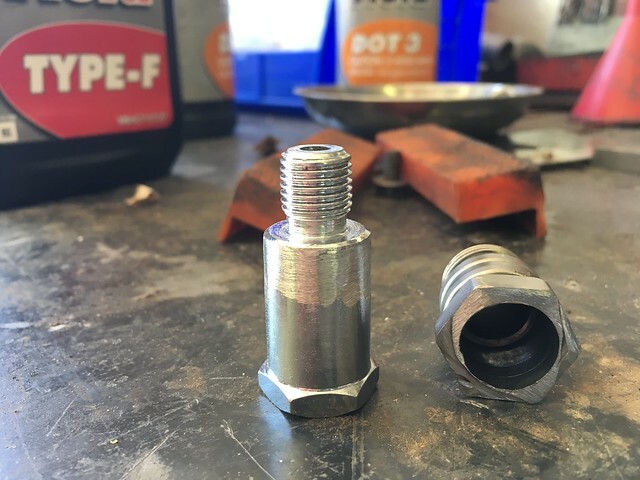 I went ahead and got the replacement that wasn’t period correct but had the threaded boss for another water temp sender. (and they had the engine assembly manual in stock now so I picked that up as well) After I ordered as I was looking at the old setup I realized that the location of the new sender would be on the wrong side of the thermostat. When the thermostat was closed or failed you wouldn’t get a proper temp. I’ll tee off the heater hose outlet for the new/additional sender. I want to keep the stock gauges in the dash for historical purposes and stealth the modern gauge in the cab where it’s not so easily noticeable. You’ll look in the car and think “oh that’s a stock interior” but there will be a somewhat hidden water temp and oil pressure. If the repros have the correct casting number I’ll pick one up otherwise I’ll leave the replacement in. Hopefully my parts will be here Weds just in time for me to finish the engine testing. Today I did compression tests, both wet and dry on each cylinder. There are tons of places that you can get instructions for the test. 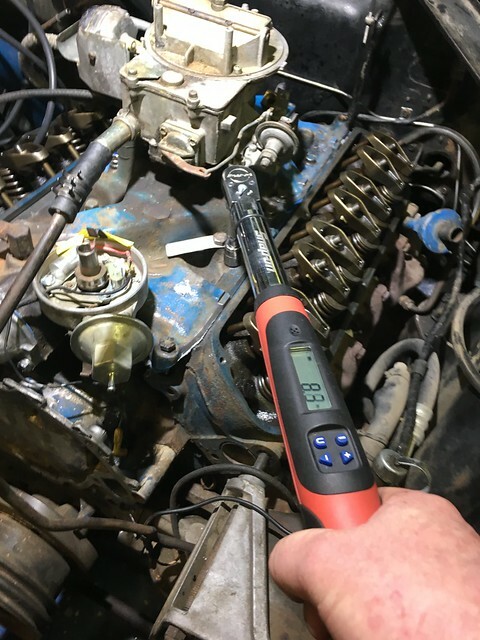 You can get the gauge as a loaner at the parts store or pretty inexpensive at Harbor Freight. 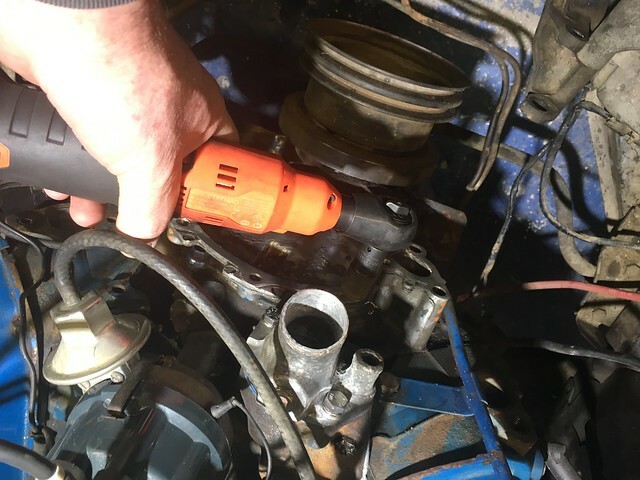 You don’t need tool truck tools, just a plug wrench, the gauge and a way to get a bit of oil into the cylinder. 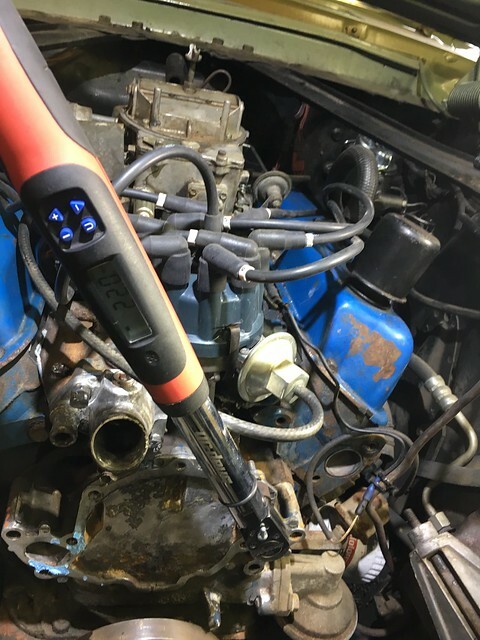 It’s an easy test that will get you good info from your engine. Google it for some good tutorials. 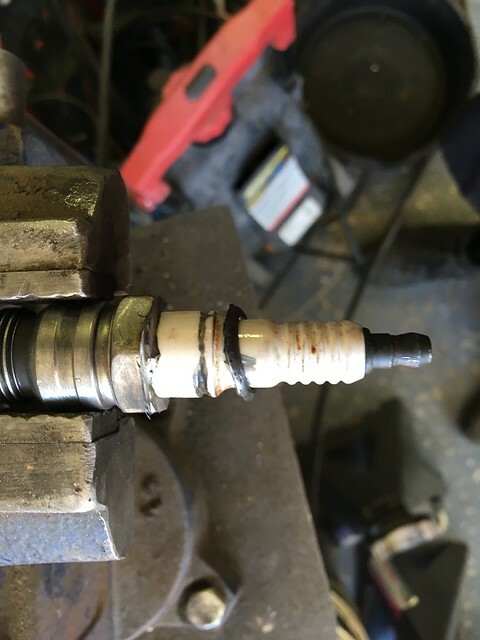 Here are what the plugs look like after about 50-60 miles of running. 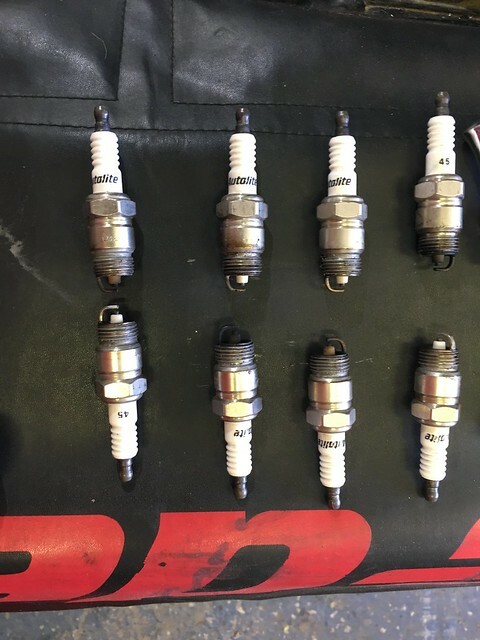 You can tell a good deal of how your engine is running by “reading” the plugs. Cylinder six is really fouled. Something is going on there. After this few miles you’d want them to look like the plugs where you can still see white on the insulator. Those others shouldn’t be that dirty with only 60 miles or so on them. The cylinder numbers are 1-4 left to right on the upper row and 5-8 on the lower row as you look at the pic. Here’s the results of the compression test. 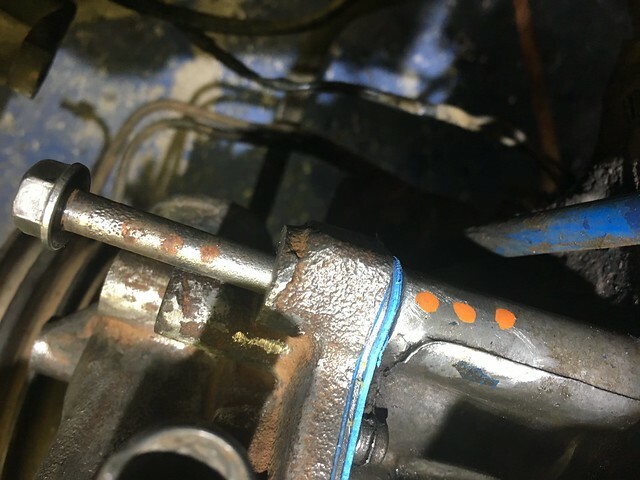 A couple of interesting findings, perhaps related to the heat buildup I saw in the thermal imaging and the history of the car running hot and sometimes overheating. And maybe even that noisy lifter. 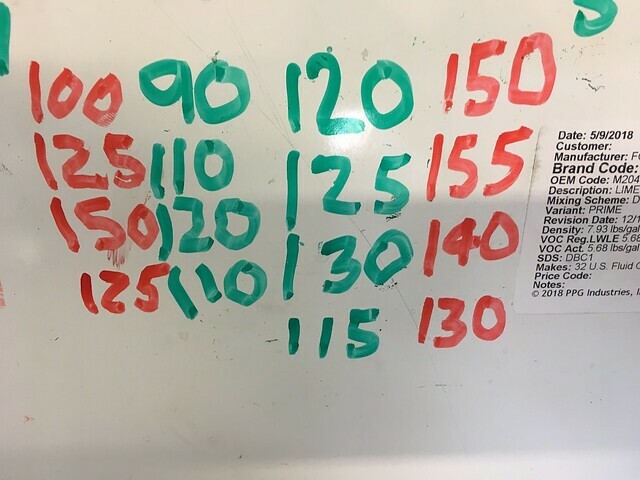 The layout of the results on my whiteboard is a bit confusing as it doesn’t map to the locations directly as you look at it. Green is the dry test, red is the wet test. You do the dry tests first then move to the wet test. 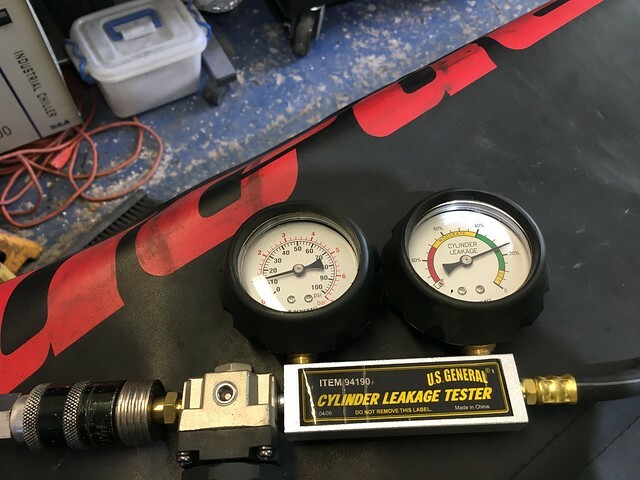 The wet test is the same as the dry except for putting a bit of oil in the cylinder to see how much better, if any, that it seals. 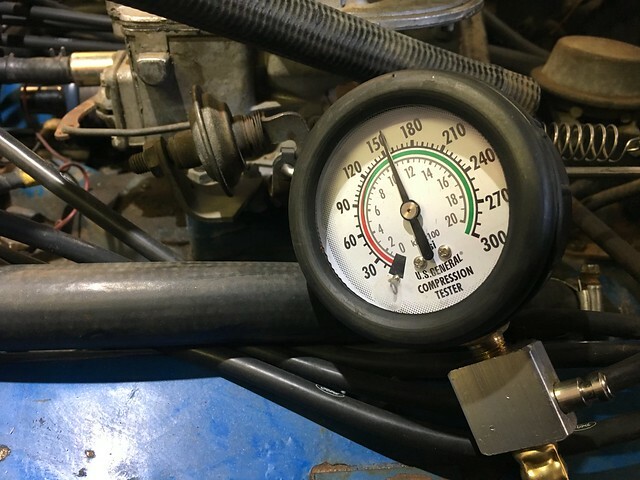 The wet test should show an increase in compression unless there is an issue in the valve train. The FSM calls for 130-170 psi at sea level. 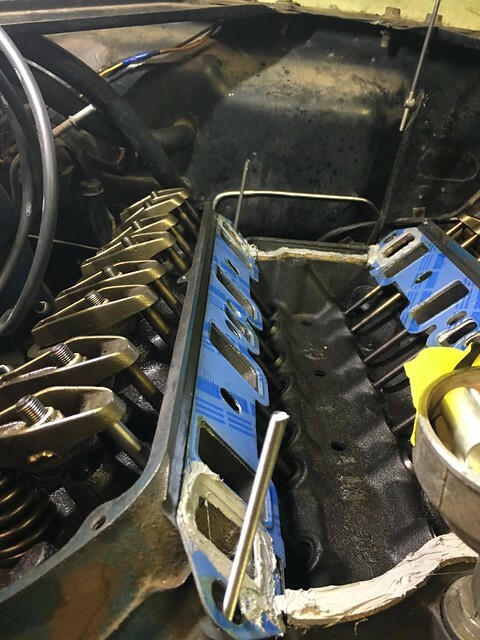 Most of it shows a 51 year old engine that has 125,000 miles on it. There are a few things that stand out and need to be investigated further. There are things that point to rebuilding it sooner rather than later but no show stoppers. At least right now. Numbers one and five are the most out of line. Hole number one readings are in bad shape. I checked it a few times. A reading of 90 is bad news. 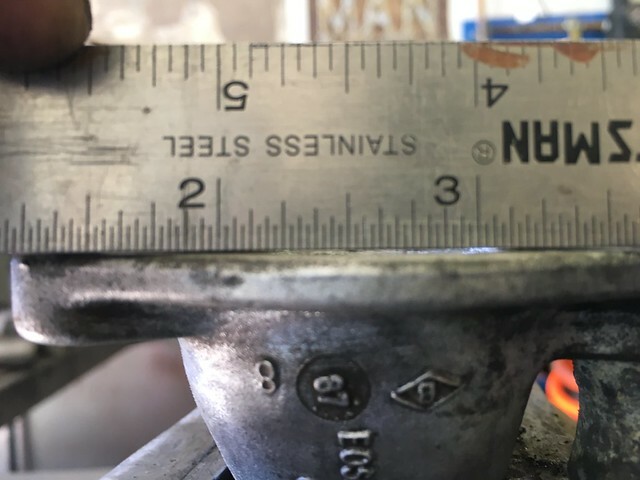 Only going up 10 psi in a wet test makes it worse. The plug is a bit burnt but not saturated in carbon like number six. It could be too lean. 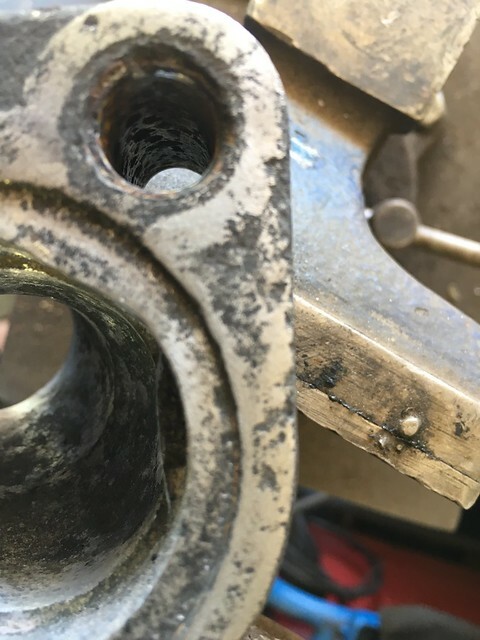 What we will start to look at is extreme wear in that hole due to heat buildup near that part of the block and damage to the valve train on that hole. Six has a great deal of carbon. 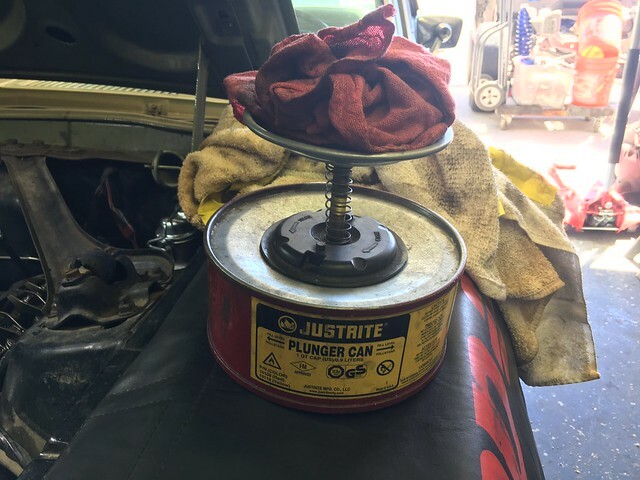 It may be the intake valve isn’t seating or is stuck partially open. It’s got the best compression readings wet and dry. It’s important not too assume too much at this point until we crack it open, measure and inspect it. Tuesday will be leak down test day. Pump went back together well. It had better. There are only two bolts, a plate and a seal. I’d still like one with the original style part numbers and casting. A lot of service on this was done before the parts guys would say “nice classic” and instead say “great, another old car”. It was/is a driver, got driven and was maintained well but maintained like a driver and not a concours. 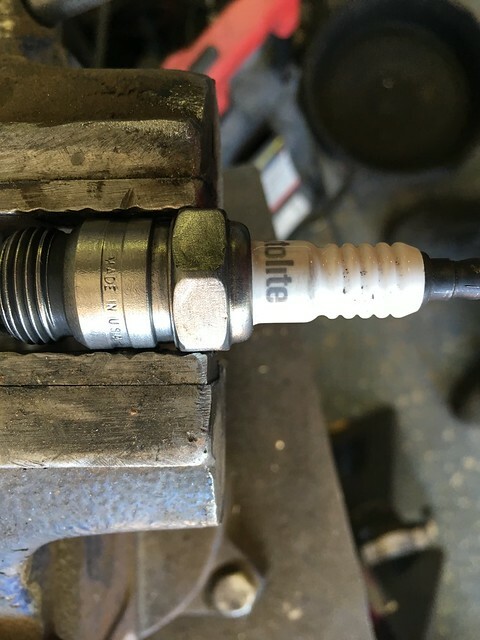 Tip for remembering which bolt goes where. Dot them with paint pens. The bad news is two of the through holes on the timing chain cover are stripped. On one I noticed it when I removed the bolt. 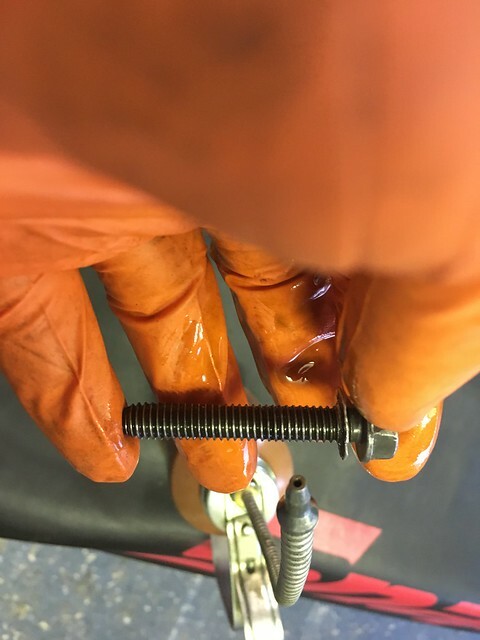 Aluminum threads were in the bolt. If I’m going to put a timing chain cover on I might as well take the engine down to the short block and check the rest of it. Don’t want to do that yet. Plus I was looking at mine and at the reproductions. The repros have fins on the top. Took a quick look at the Mannel book to see exactly what was on mine. Was mine an original or did someone swap it at one point? It looks like it has never been off and still has some Ford corporate blue on it. The book says mine doesn’t have the fins. Fins only for the early 67. Mine should look like it does. But it’s hammered and has two stripped holes. So time for a couple of Helicoils. 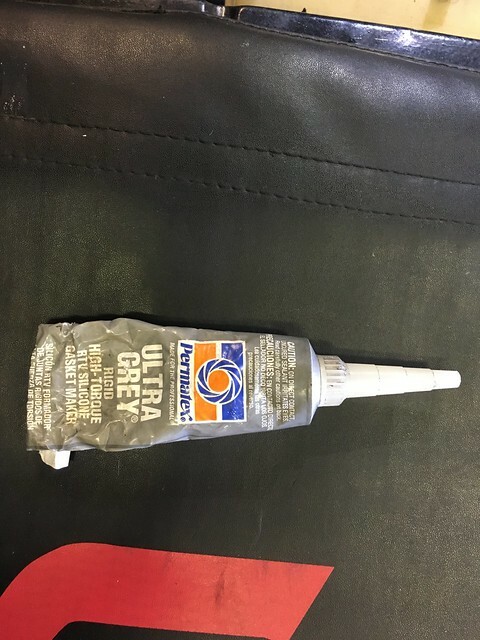 If you aren’t familiar a Helicoil is a thread replacement. As the name indicates it’s a coil that you install in place of the stripped threads. First you drill the existing threads out enlarging the hole. It’s usually some size drill you won’t have in your index. This one is a 21/64. The kit provides a special tap to use in the enlarged hole. 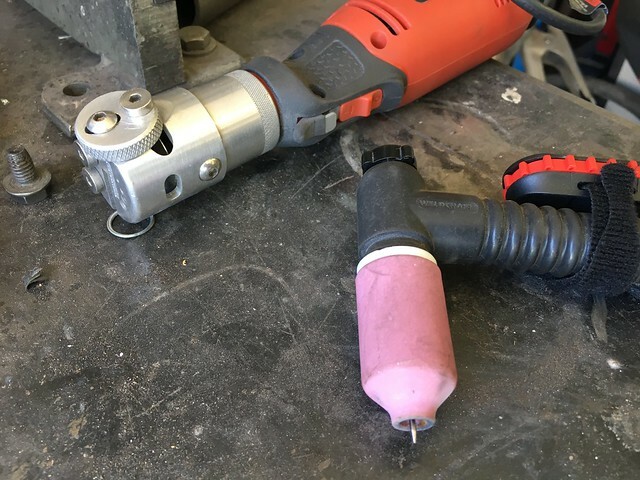 Once you thread the hole with the replacement tap there is a tool to insert the coil into the newly cut threads. The insertion tool can be a bit though to use at first. 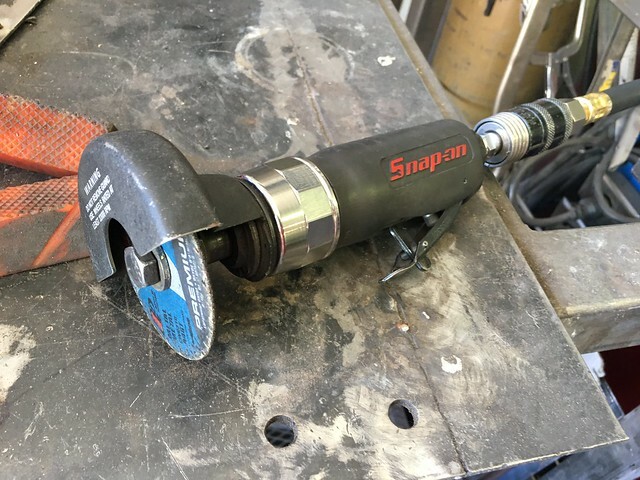 Screw the coil in, break off the tang in the rear of the hole and you’re good to go. 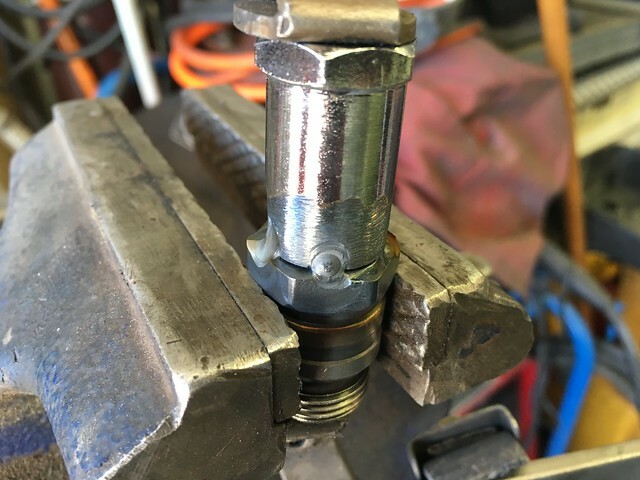 To test the inserts I take something to bolt to the repaired hole. In this case I use the spacers used to mount the smog pump. I tighten the fastener to the torque that will be used in the final assembly to see if it holes. 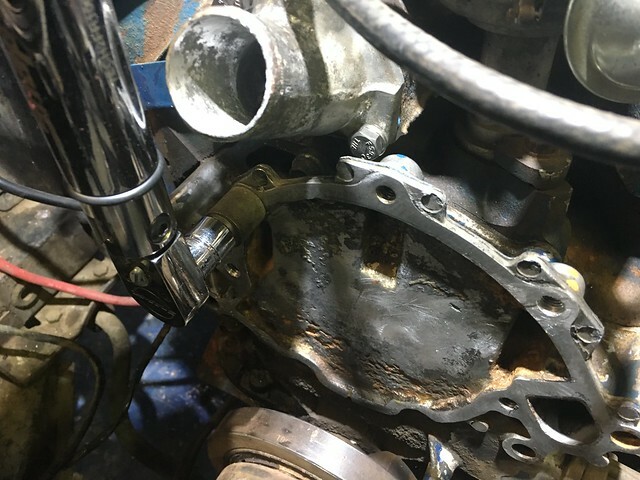 At this point I now have two repaired holes that will support the torque to install the water pump. Now for the final bolt and torque. 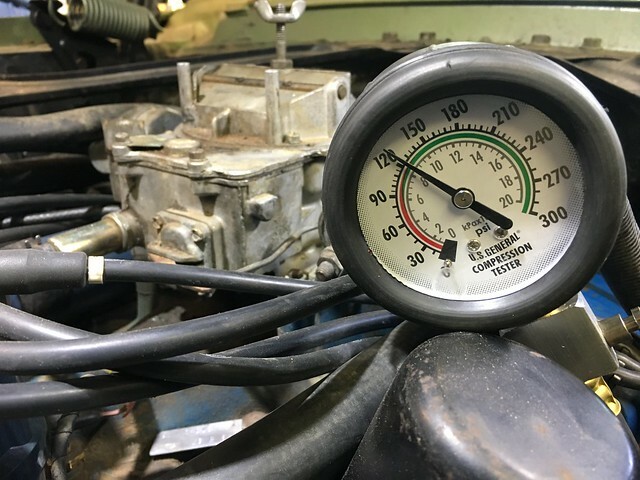 If it’s a part of the rotating assembly or fluid conveyance system (oil, water, fuel), has a critical gasket, steering, brakes or suspension I use the torque specs. This is it just prior to installing the smog pump. Yeah baby, real San Jose car with first generation emissions. Original FoMoCo engraved spacers for the smog pump mount (the empty hole in the pic above). I didn’t notice the engraving until I cleaned them up. Check all the connections, everything is good and tight. Ready to do a test fill. The test fill was going well until it got to the thermostat/outlet fitting. Leaking. Not a stream but a steady drip. 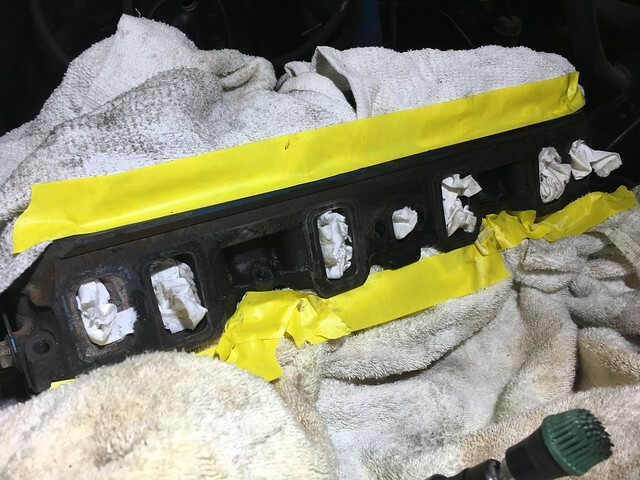 At first I thought I’d hosed the manifold gaskets on the install. 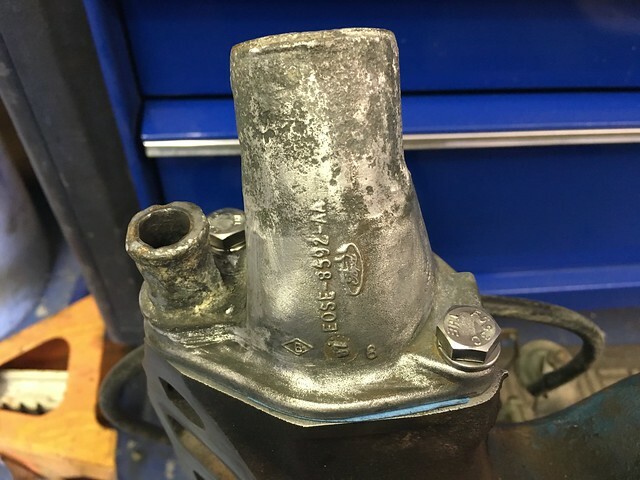 After taking a look-see with the borescope it was coming from the underside of the fitting. And no wonder. That space where the light comes through around the 3″ mark on the rule should be flat. There is a nice warp in the face of the fitting. The indent where the thermostat sits is worn as well. I could surface a bit off the fitting but the indent is still in bad shape and that’s a lot of trouble to go through for a $20 part. One of the problems when restoring parts like that is when you take the kack off sometimes that kack is what is preventing the leak. 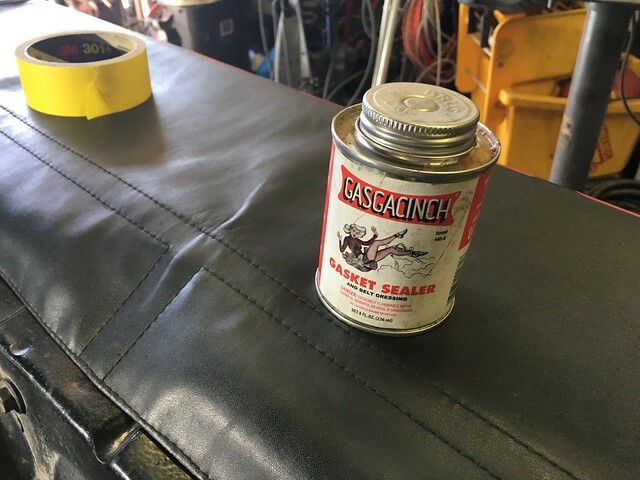 There is some severe pitting I thought would be taken care of with the Gaskacinch. No such luck, too badly gone. I could RTV it and it would hold but it will eventually need to be fixed properly. The issue I have now is getting a part with the same stamping as I have now. The repros have the part number but not the original Ford logo. That’s where I am now, waiting on parts. Or rather looking for the parts I’d rather have. I’ve checked the usual dealers but I’ll need to dig some more using the part number from the casting and the Mannel book. I’m half temped to spuck the thing together or get a part to tide me over and run it a bit in the meantime to get a handle on other issues like steering and suspension. Until I’m sure it’s more reliable I’m not going to stray outside of a 15 mile radius from my house. That’s what my Hagerty road service will provide should I get beached again. In the current state I can at least do leak down and compression tests. I’ll take it from there and see what happens. there was something that was rock hard. I poked it with pick, no go. rat dung. With some acorns hardened into it. So that happened. the surfaces are ready to go. on top and you’re set to wipe. read the printing on them). 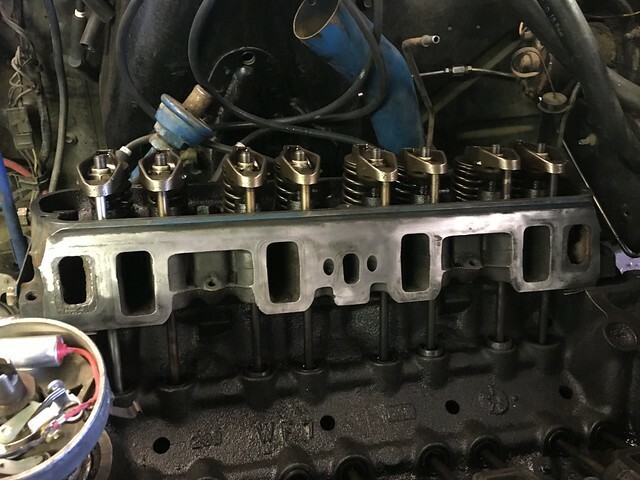 The thermostat housing is reinstalled with a new thermostat and gasket. 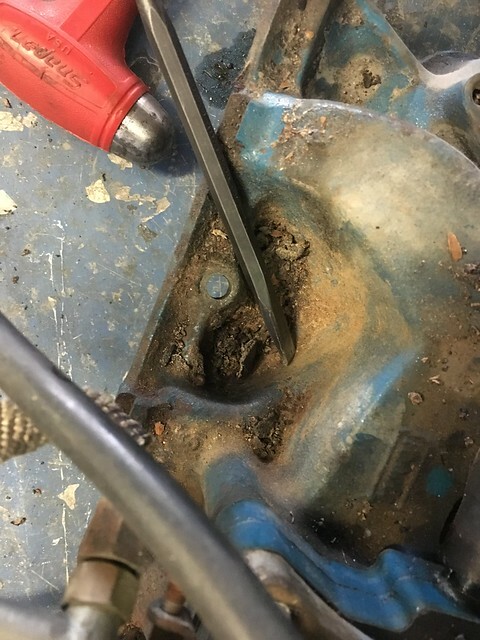 the bolts had a stripped head. The outlet needed quite a bit of work. The bypass was severely restricted and needed to be clearanced. lighter but it makes it easier align. Now we do a two step torque following the sequence and specs in the FSM. The first step is to 14 ft/lbs, the second to 21 ft/lbs. to the timing chain cover and what I’m doing to work past it.